muting your microphone (in a group chat) and/or your camera (if wandering away). 1. 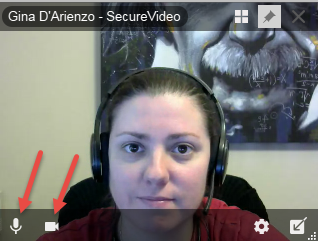 If your video tile is popped out, hover your mouse over your own video window (i.e., your own face), so that a panel appears at the bottom of it. 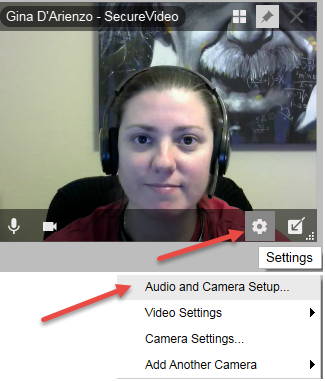 Then, click on the gear icon, and select Audio and Camera Setup... from the drop-down menu. 2. If both video tiles are in the same VSee window as seen in the image below to the right. 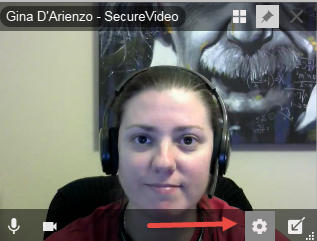 Click on the gear icon along the bottom, and select Audio and Camera Setup... from the drop-down menu. 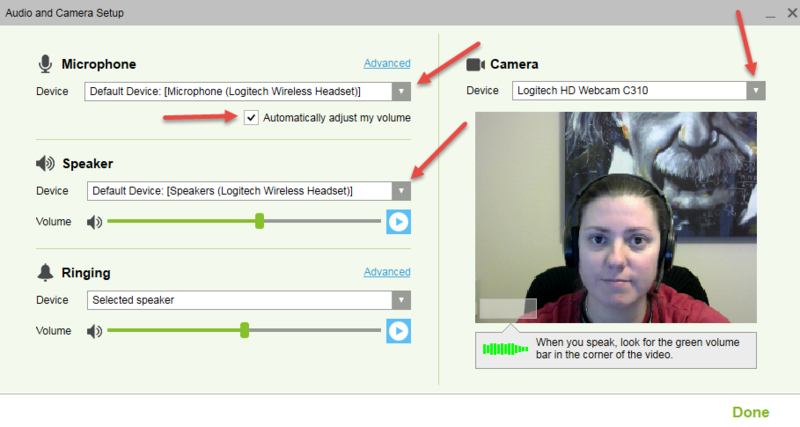 Microphone: If you see green lines on the video preview when you speak, then your microphone settings are correct. 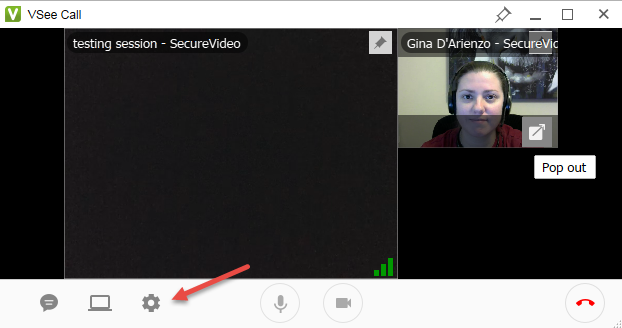 If you don't see any green lines, click on the down arrow (circled in red) to choose another microphone. NOTE: If your microphone setting is correct, but you are still not registering sound, uncheck the box next to Automatically adjust my volume, and ensure that the volume level is not set to zero. Speaker: If you hear a sound when you click on the play button here, then your speaker settings are correct. If you don't hear any sound, check to make sure that your computer volume is turned up high and try again, or click on the down arrow next to the speaker device to choose another set of speakers (like your headset). If you can't hear the test sound, but your computer plays other sounds, try checking to make sure your drivers are working properly. Camera: If you can see yourself, then your camera settings are correct. If you don't see yourself, click on the down arrow next to the current camera device name to choose another camera. 2. Or hover the mouse over the bottom of the VSee window. 2. Click on the gear icon in the lower right-hand corner, and select Video Settings from the drop-down menu, then Resolution, and then choose the desired resolution. This article was last reviewed by our Support team on August 16, 2017.